Are any words left unsaid about the re-emergence of Taylor, Texas barbecue legend John Mueller? Yes, plenty. A 50,000 word bio of the foul mouthed pit boss could easily be penned and, I predict, do huge business in the world of Texas barbecue letters. 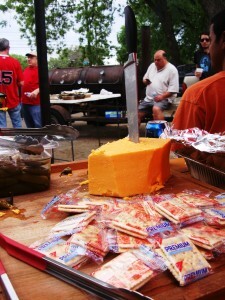 Here’s a photo of the perfect accompaniment to a pile of beef chuck ribs; a giant block of Longhorn cheddar. This picture was taken at the six month anniversary of JMueller BBQ in the Bouldin Creek neighborhood of South Austin. This entry was posted in Texas Barbecue, Texas Barbecue Photos and tagged barbecue, BBQ, best barbecue, Brisket, central Texas hot guts, sausage, Taylor Texas, Williamson County. Bookmark the permalink.